Didlake employees Vincent Jesionka, Kathy Weaver, Laura Byington and Joseph Wage (left to right), along with Didlake President and CEO Rex Parr (second from left), visited the Virginia State Capitol for the Annual Rally for Individuals with Mental Disabilities on Jan. 17. Richmond, VA – A team of Didlake, Inc. employees and consumers traveled to Richmond to meet with Virginia state delegates and senators on Jan. 17 as part of the Annual Rally for Individuals with Mental Disabilities, an event coordinated by The Arc of Northern Virginia. The group visited the Virginia State Capitol to communicate to legislators the needs of citizens with intellectual disabilities and the organizations that support them. The self-advocates included Didlake consumers Laura Byington of Dumfries, Kathy Weaver of Bristow, Vincent Jesionka of Woodbridge, and Joseph (J.P.) Wage of Manassas. All four individuals are currently employed at Didlake’s Business Service Center in Manassas. They presented a letter to legislators highlighting the fact that Virginia ranks 48th in per capita spending on community supports for people with disabilities despite being the eighth wealthiest state. Specifically, the letter requested maintaining the current Medicaid reimbursement rates for providers, which keeps people with disabilities out of state institutions, and to reverse reductions proposed for Long Term Employment Supports and Extended Employment Services to prevent a loss of 500 jobs. Since the rally, amendments have been proposed in Virginia legislature in favor of both requests. Didlake, Inc. is a not-for-profit corporation headquartered in Manassas, Virginia. It was founded in 1965 to create opportunities for people with disabilities through services that connect them to employment, education and the community. It provides contract business services for commercial and government customers and has won numerous awards for its facilities maintenance; packaging/ assembly; and administrative services. The organization operates throughout the Washington, D.C. metro area, in the Roanoke Valley and in Greater Hampton Roads. It has an annual operating budget exceeding $50 million and provides services for, and in many cases employment, for more than 1,400 people with disabilities annually. Didlake, Inc. is licensed by the Commonwealth of Virginia, accredited by CARF and proudly serves the nation through the AbilityOne program. Its partners include the Virginia Department of Rehabilitative Services, local Community Services Boards and United Way of the National Capital Area. For more information go to www.didlake.org. 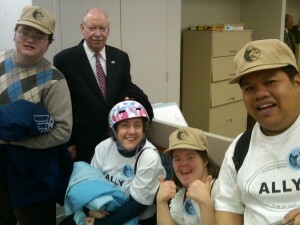 The Arc of Northern Virginia is one of 732 local chapters of The Arc, a national organization whose mission is to promote and protect the human rights of people with intellectual and developmental disabilities and actively support their full inclusion and participation in the community throughout their lifetimes.